Tunisia reached the final of the African Cup of Nations after a dramatic penalty shoot-out win over Nigeria. Karim Hagui put away the winning kick after Ali Boumnijel saved from youngster Peter Odemwingie. The match came to life in the second-half when Jay-Jay Okocha scored from the spot after Nwankwo Kanu was fouled. 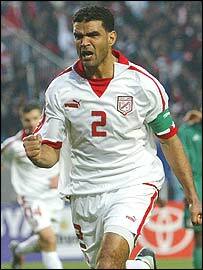 With eight minutes left Tunisia's Khaled Badra scored a penalty equaliser after Ziad Jaziri was tripped. Before Okocha's opener, both sides created very few clear-cut chances. Nigeria played pretty football without being a potent threat while Tunisia were happy to fire long balls for striker Francileudo dos Santos, without much success. 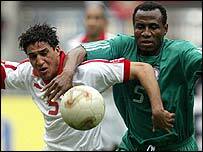 The Brazilian-born Tunisian was well shackled by defenders Isaac Okoronkwo and Joseph Yobo for most of the match. Dos Santos did manage to get away midway through the first-half, but he failed to arrive into the penalty area in time to latch on to midfielder Mehdi Nafti's pass. Then moments before the break Santos controlled Hagui's ball on his chest in the six-yard area but smacked his effort wide of Vincent Enyeama's goal when it appeared easier to score. After the interval the same tense battle resumed until the 65th minute when Kanu broke into the penalty area and was brought down by Hagui. Up stepped Okocha who, at the second time of asking, put away his kick to send the small number of Nigeria fans into raptures. Hosts Tunisia were in need of some emergency inspiration with just a quarter of the match remaining. The appearance of substitute Slim Benachour seemed to do the trick. The playmaker livened up the dispirited side as they pressed forward. He almost brought them level within seconds of coming on, but fired his 20-yard effort fractionally wide of the Nigeria goal. With just minutes of the match remaining, the relatively quiet Jaziri skipped past Seyi Olofinjana, only for the defender to catch his trailing leg. It was left to Badra to put away the spot-kick. It was a bittersweet moment for the captain, who had picked up a yellow card earlier in the match meaning he would miss the final. The match was now almost destined to go to extra-time. But once the additional 30 minutes started, it seemed that neither side had the energy to search for a winner. Young Nigeria forward John Utaka came closest to settling the matter, but his powerful low strike was palmed away by Boumnijel. And so to the dreaded penalties. Captain Badra stepped up first for Tunisia and buried his kick. Utaka then equalised before Santos made it 2-1. But advantage swung in the way of Tunisia when young Odemwingie saw his effort saved by Boumnijel who dived superbly to his left. Tunisia's Imad Mhedhabi and Slim Benachour and Nigeria's Joseph Yobo and Ifeanyi Udeze then all successfully put away their spot-kicks. It was left Hagui, who had earlier conceded a penalty, to hold his nerve and fire the winner. The defender took a deep breath and sent his kick high into the roof of Enyeama goal, to the delight of his team-mates and the thousands of Tunisia fans at Stade Rades.